1. Over 300,000 jobs were added in January… continuing the streak and roughly doubling what the economic experts expected. That stat gave Trump a launch pad for the litany of good economic news: most Americans ever employed, rising wages, lowest minority unemployment rates,etc. 2. Virginia Governor’s radio defense of post-delivery (i.e. “4th trimester” abortions). Just because NBC, CNN and NYT don’t report it, doesn’t mean it’s not true. It’s on tape! For details, see: Is Virginia going to jump the abortion shark? Less than 20% of Americans favor 3rd trimester abortions. No data is available, but I’m hunching that far fewer favor post-delivery abortions. 3. Last Saturday, US Customs and Border Protection on the US-Mexico border made the largest seizure of fentanyl in the agency’s history. That’s according to CNN and it’s a tough pill for the drug-flow deniers to swallow. The MSM trumpeted the fact that the seizure was made at a port-of-entry, proving that in-place security measures are doing the job. It’s a stretch of the border that has a wall that channels the drugs and illegals to the ports of entry. See Should the border wall between San Diego and Tijuana be torn down? 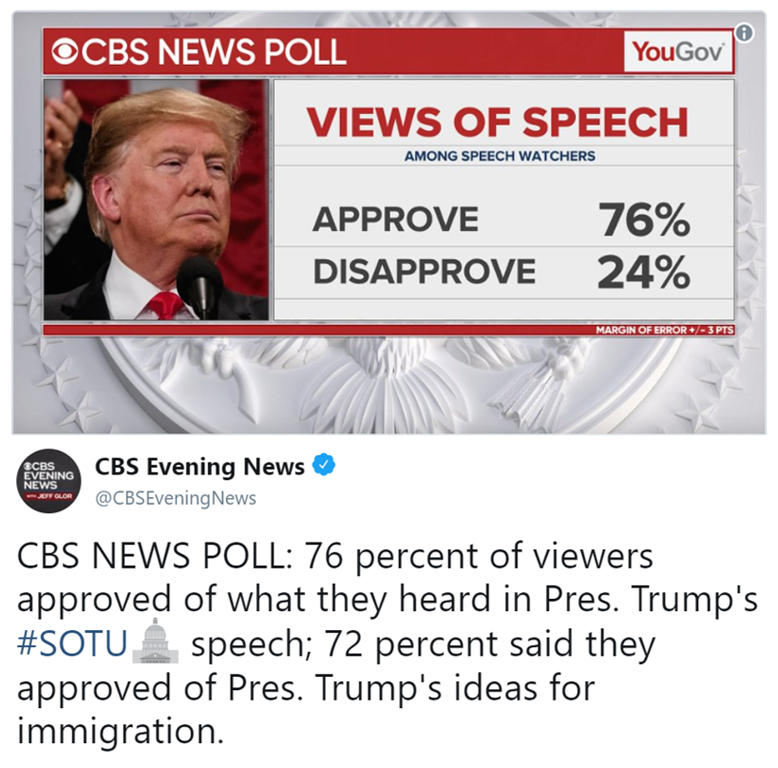 A good night for the President .. a bad night for the haters. This entry was posted on February 6, 2019 at 6:59 am and is filed under SOTU, Trump, President Donald J., Trump-haters. You can follow any responses to this entry through the RSS 2.0 feed. You can leave a response, or trackback from your own site.